Credit : Jeffrey Farrell, Schier lab, Harvard University. 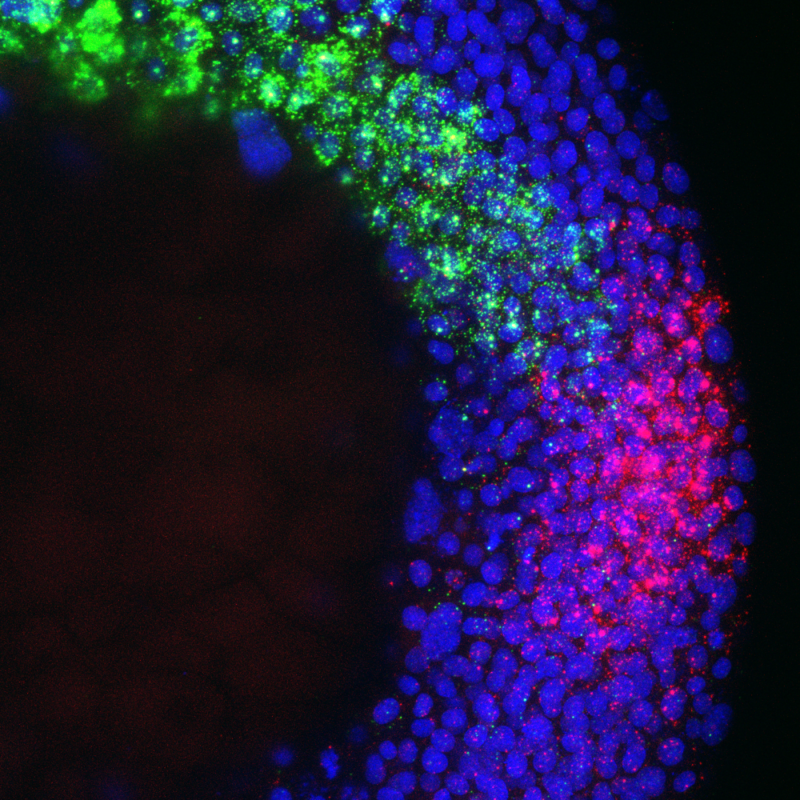 A mid-gastrulation zebrafish embryo, with two axial mesoderm populations adopting their cell fate identities. (Blue: DNA. Red: Prechordal plate, gsc RNA in situ hybridization. Green: Notochord, ntd5 RNA in situ hybridization.) View full-size image. During embryonic development, a single cell eventually gives rise to all other cell types and tissues in the body. Now, by profiling gene expression in thousands of individual cells during the earliest stages of zebrafish development, a team of researchers from Harvard University and the Broad Institute of MIT and Harvard has provided a staggeringly detailed picture of how cells switch genes on and off as they divide and differentiate into a variety of tissues. Measuring RNA in individual cells, rather than averaging millions of cells together, enabled the researchers to build a comprehensive gene-expression dataset of 38,731 zebrafish embryo cells. Using a new computational approach to analyze the data, the team mapped the developmental trajectories and relationships of 25 different emerging cell types in the early hours of zebrafish development. The team describes these results in a recent issue of Science with co-senior authors Aviv Regev, core institute member and director of the Klarman Cell Observatory at Broad Institute and a Howard Hughes Medical Institute Investigator, and Alex Schier, associate member at Broad and professor at Harvard University. The paper is one of a trio focusing on single-cell analysis of vertebrate embryogenesis; the others were published by teams at Harvard Medical School. To individually profile tens of thousands of cells, the research team used Drop-seq — a technology developed in 2015 by a team based at the Broad Institute and Harvard Medical School, led in part by Regev, Broad associate member David Weitz, and Broad institute member Steve McCarroll. From nearly 700 zebrafish embryos, Farrell and colleagues collected the 38,731 cells over a 12 hour period and recorded their individual gene expression profiles. Surprisingly, the researchers also uncovered patterns in the data that indicated the presence of what they called “intermediate cells,” which expressed genes that appeared to mark them for two different cell fates. The team hypothesizes that these cells initially express markers for one developmental path, but later alter their gene expression and change trajectories, directed to their final type by the environmental cues between two neighboring tissues in an embryo. As a proof of concept, the team compared the wild-type developmental tree to data collected from zebrafish embryos with a mutation in the Nodal signaling pathway (a molecular pathway that ensures certain tissues will develop in the right places). In these analyses, the team discovered that while certain cell types and tissues were completely missing from the Nodal mutants, the remaining cells expressed genes similarly to those in the wild-type embryos. This study was funded by the National Institutes of Health, Allen Discovery Center for Cell Lineage Tracing, Jane Coffin Childs Memorial Fund, Charles A. King Trust, Howard Hughes Medical Institute, and the Klarman Cell Observatory.